This really is the best Chocolate Covered Strawberries recipe for all your special occasions! This 4-ingredient recipe is a quick and easy treat to enjoy for Valentine’s Day, Bridal Showers, and more! 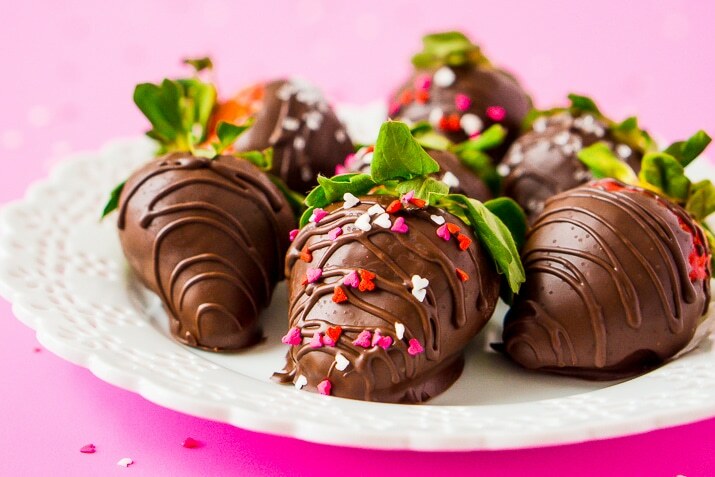 How many of you LOVE Chocolate Covered Strawberries? I know I do, in fact, I love them so much that I admit there have been times when I have spent way too many dollars on them! But they’re so easy and relatively cheap to make at home, and I can make a lot more than the 6-packs the boutique candy stores like to sell for $20 a box! And with Valentine’s Day right around the corner, there’s no better time to start making your own at home! However, there’s always been something about Chocolate Covered Strawberries that I’ve always hated, and that’s that when you take that first bit, the rest of the shell cracks and falls away from the strawberry, therefore ruining the rest of the strawberry eating experience. So this recipe solves that issue by adding a small amount of coconut oil into the chocolate. This keeps the chocolate softer after it sets and allows it to stick to the strawberry even when you bite into it. I also like to add a touch of vanilla to my chocolate mixture because it intensifies the flavor a bit. It’s also fun to add sprinkles depending on the occasion or holiday! This recipe will cover about 18 strawberries, but it can vary depending on their size. Always make sure to clean and dry strawberries before dipping in the chocolate. In a medium bowl, melt the chocolate chips and coconut oil in the microwave on 30-second intervals, stirring between each one until chocolate is smooth. Stir in the vanilla extract until fully combined. Dip the strawberries in the chocolate making sure to cover all sides and place on wax paper to set. 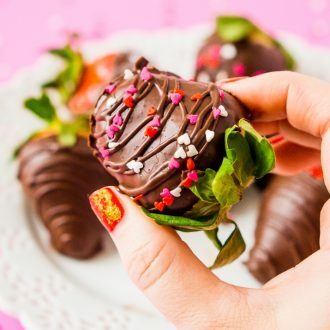 Add any remaining chocolate to a frosting or Ziploc bag and cut a tiny corner piece off and drizzle the remaining chocolate over the strawberries. You can add sprinkles if desired before the chocolate solidifies. Let the chocolate set for about 30 minutes, store in the fridge if not consuming immediately. Pin this Dessert Recipe for Later! This really is the best Chocolate Covered Strawberries recipe for all your special occasions! This 4-ingredient recipe is a quick and easy treat to enjoy for Valentine's Day, Bridal Showers, and more! These look so fun and easy to make. Love them for Valentine’s Day! Perfect step by step tutorial on how to make my favorite treat! 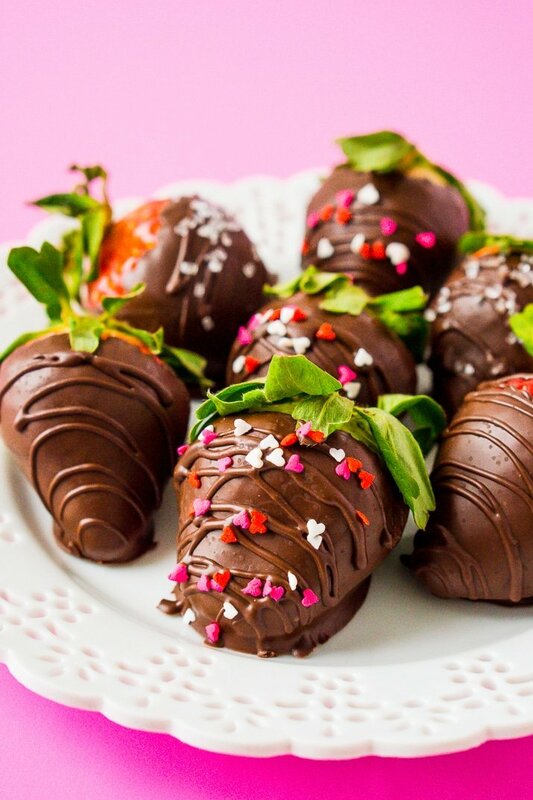 Chocolate covered strawberries are always so good. I love the fruit with the chocolate so I feel a little healthier while indulging! 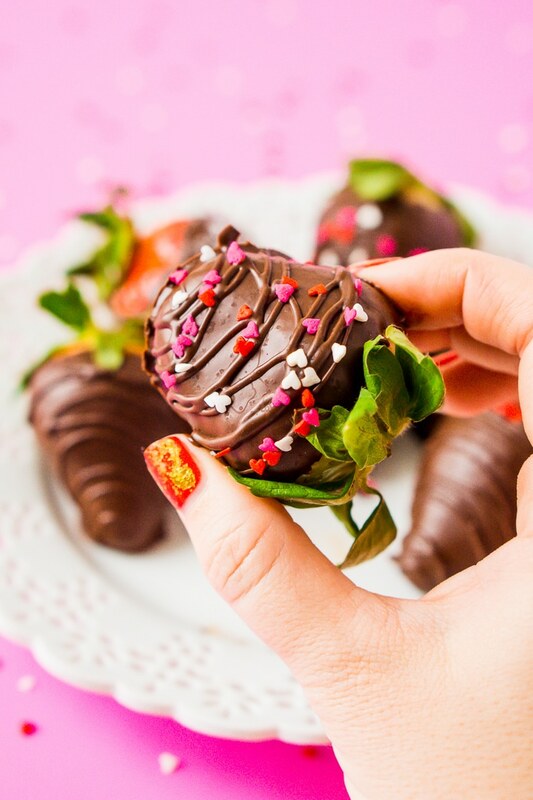 Love your tip about the cracking chocolate shell, I can’t wait to try these…if only I can find big juicy strawberries! !